Overwhelmingly, observers at that time declared a major nodal point had arrived in the evolution of a new “multipolar world,” that the U.S. had lost its superpower status while China was feeling its new-found strength, was “standing up to the U.S.” and would block U.S. plans to sanction Iran. At the time, looking at the facts at hand, I objected strongly to this assessment. (See: especially Middle East Economic Survey, and Q&A of this talk at the Middle East Institute Sept. 2009, in D.C.) In fact, China ended up dropping this public campaign and agreeing to U.S. sanctions. No major confrontation whatsoever ensued. Thus far, in 2012, China is again coming along, albeit slowly and step-by-step, with what is going to be a much more severe sanctions regime than that of 2010. And Beijing is coming along for exactly the same reasons it did in 2010: because its objections are not fundamental, they are well-defined business-like worries about its energy security and investments in Iran. The U.S. precisely knows this, and therefore knows exactly what to do to ‘take care’ of Beijing’s angst over Iran sanctions. This might give the impression things are not going well as far as China agreeing to oil sanctions. However, on Tuesday (13 Feb.) Mr. Xi was at the White House, where, first, Vice President Biden has a meeting with Xi where he was tasked with giving him a bit of a tongue lashing on Syria, China’s currency policy and such. However, according to press reports, Biden did seem to complain at all about China’s policy on Iran. 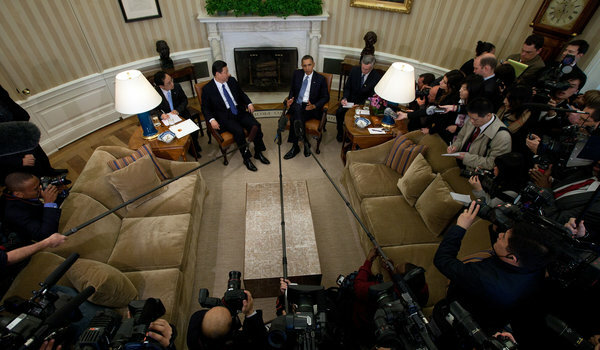 Moreover, shortly after this meeting, Mr. Xi was in the Oval Office meeting with President Obama. Indeed. The point here is that, just like in 2010, any Chinese objections thus far in 2012 should not be seen as a fundamental demand that the U.S. not impose sanctions, or that the U.S. not confront Iran over expanding its regional power (via its nuclear program, its conventional forces or whatever). China is not opposed to this basic thrust of U.S. policy against Iran. And, indeed, Washington (with Saudi assistance) has a history of taking care of Beijing, and has established a certain reserve of good will in this regard from the last round in 2010 which it can draw upon. In the previous round, in 2010, the father of modern U.S.-Chinese diplomacy, Henry Kissinger, was even enlisted by the Obama administration to make a trip to Beijing to sort out the arrangements. In the end, the investments that China had made in oil and gas before that round of sanctions were somehow ‘grandfathered in’ (Spanish: tratarlas como derechos adquiridos) in spite of the U.N. Security Council’s June 2010 sanctions. This entry was posted in China, Energy and Environment, international relations, Iran nuclear, Iran sanctions, Persian Gulf, Resource conflicts, The USA, Uncategorized and tagged Beijing, China, Iran, Sanctions against Iran, United Nations Security Council, United States, Xi Jinping. Bookmark the permalink.